2. 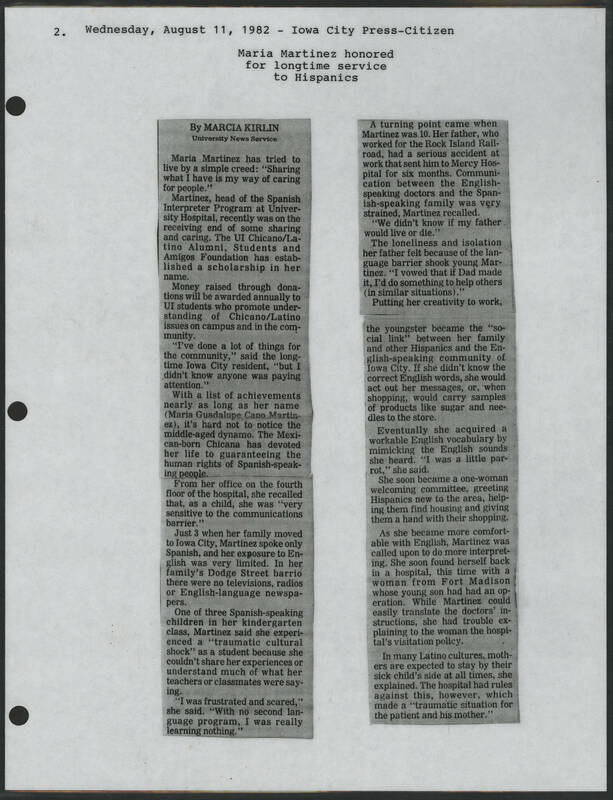 Wednesday August 11, 1982 - Iowa City Press-Citizen Maria Martinez honored for longtime service to Hispanics By MARCIA KIRLIN University News Service Maria Martinez had tried to live by a simple creed: " Sharing what I have is my way of caring for people." Martinez, head of the Spanish Interpreter Program at University Hospital, recently was on the receiving end of some sharing and caring. The UI Chicano/Latino Alumni. Students and Amigos Foundation has established a scholarship in her name. Money raised through donations will be awarded annually to UI students who promote understanding of Chicano/Latino issues on campus and in the community. "I've done a lot of things for the community," said the long time Iowa City resident. "but I didn't know anyone was paying attention." With a list of achievements nearly as long as her name ( Maria Guadalupe Cano Martinez), it's hard not to notice the middle-aged dynamo. The Mexican born Chicana has devoted her life to guaranteeing the human rights of Spanish-speaking people. From her office on the fourth floor of the hospital she recalled that, as a child, she was " very sensitive to the communications barrier." Just 3 when her family moved to Iowa city, Martinez spoke only Spanish and her exposure to English was very limited. In her family's Dodge Street barrio there were no televisions, radios or English language newspapers. One of three Spanish speaking children in her kindergarten class, Martinez said she experienced a "traumatic cultural shock" as a student because she couldn't share her experiences or understand much of what her teachers or classmates were saying. "I was frustrated and scared," she said. " With no second language program. I was really learning nothing." A turning point came when Martinez was 10. Her father, who worked for the Rock Island Railroad, had a serious accident at work that sent him to Mercy Hospital for six months. Communication between the English speaking doctors and Spanish speaking family was very strained, Martinez recalled. "We didn't know if my father would live or die." The loneliness and isolation her father felt because of the language barrier shook young Martinez. " I vowed that if Dad made it, I'd do something to help others (in similar situations)." Putting her creativity to work,. the youngster became the "social link" between her family and other Hispanics and the English speaking community of Iowa City. If she didn't know the correct English words, she would act out her messages, or, when shopping, would carry samples of products like sugar and needles to the store. Eventually she acquired a workable English vocabulary by mimicking the English sounds she heard " I was a little parrot," she said. She soon became a one woman welcoming committee, greeting Hispanics new to the area, helping them find housing and giving them a hand with their shopping. As she became more comfortable with English, Martinez was called upon to do more interpreting. She soon found herself back in a hospital, this time with a woman from Fort Madison whose young son had had an operation. While Martinez could easily translate the doctors' instructions, she had trouble explaining to the woman the hospital's visitation policy. In many Latino cultures, mothers are expected to stay by their sick child's side at all times, she explained. The hospital had rules against this, however, which made a "traumatic situation for the patient and his mother."